What Businesses Benefit From Route Optimization? Route optimization has become a great solution for many businesses. bMobile Route has invested some serious time and energy to create a comprehensive solution that fits several different models for our customers. We found that the needs primarily fit into two groups. Delivery and Sales drivers see the same customers on the same day of the week regularly, and the schedule does not change often. Delivery and Sales drivers see groups of customers on varying schedules, or on demand. A second sub set of this group is field based representatives that may or may not start or stop at the loading point. If the stop sequence for your drivers doesn’t change much each day or week, you would be best suited for the bMobile Route Optimization Level I, which allows the administrator to set up the standard routes, and only optimize when things change. This means new stops are entered onto a regular, repeating route, and when a new stop is added, optimization will re-sequence all the stops based on chosen criteria and then show the re-optimized route on a map. If on the other hand, the stop sequence for your drivers changes often, you would be better off with the bMobile Route Optimization Level II, which allows for the drivers to optimize their route first thing in the morning, and also to re-optimize in the field as things change throughout the day. So if the delivery or visit schedule changes day to day, or the driver is receiving off-route calls, or starting or ending their route in a different place, the system allows the driver to manage their route and re-optimize on the device along the way. Our analysis of the market discovered solutions that cost between $30 and $50 per truck, per month. Since we created a solution with some key functions, but without other unnecessary ones that our customers said were not needed, our system ranges from $15 per user on the low end, to $20 per user on the high end. Pricing depends on scope of functions, and usage level. Address Verification – Receives and verifies addresses including Latitude and Longitude coordinates, which are then saved in stop information. Latitude and Longitude Update – Adjusted stop point coordinates can be recorded on the device, i.e. when navigation to the back of the store may be better / more efficient, and you would like the step by step directions to reflect that. Time Window for Delivery – Stop time window information can be factored for optimization, i.e. receiving dock is open from 6 AM to noon. Start and End Point – For level 2 users, devices can use current location to define the starting point, and use a different address as the end point for the day. 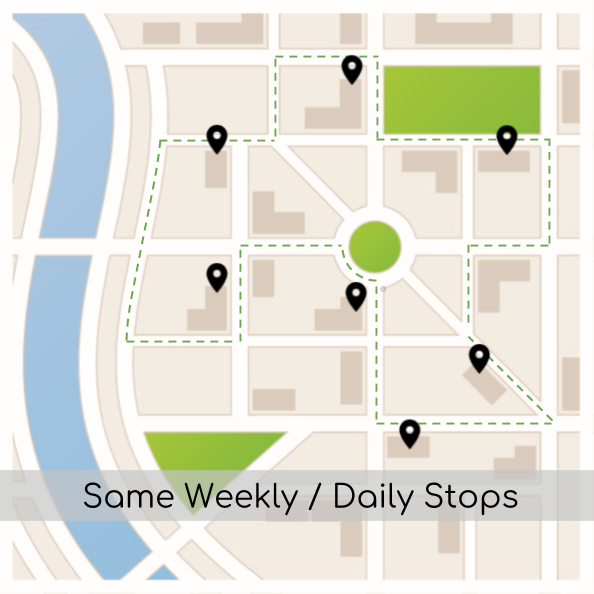 Additional Stops – Level 2 users can add new ad-hoc stops during the day and re-optimize for new customer visits on-demand. Partnership – bMobile Route wants to be the number 1 choice for integrated Route Optimization and Mobile Order Management solutions, but more importantly, we want to be a partner in your business success! Lastly, we want to give you a chance to try out the Route Optimization Add-On by offering you a 7 Day Free Trial! Contact us today for a demonstration of how our new Route Optimization solution can help you organize your stops to save time and money, and increase possibilities for new revenue!